Calcium also serves as an integral cofactor in numerous biochemical reactions and Magnesium is known to be involved in more than 300 metabolic reactions. 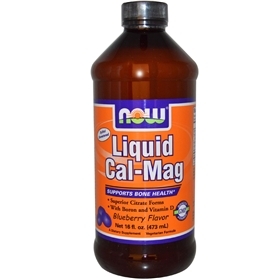 In addition, Magnesium and Calcium work together in several physiological systems, providing support for the maintenance of healthy cardiovascular function as well as for healthy muscle function. Boron is a biologically active trace mineral which affects calcium, magnesium and phosphorus metabolism. Boron is known to support bone strength and structure. Boron is helpful in preventing the human body from increases of uric acid levels and osteoporosis. Boron can be helpful in the process of vitamin D production in the body, and seems to assist the body in using other minerals such as calcium and magnesium. Boron is also found to have some effect in regulating the amount of mineral absorption from the kidneys. It is mostly known for helping maintain the level of calcium in the body, necessary to prevent osteoporosis. It is being studied for its positive effect on the prostate as well. Suggested Usage: Shake well. As a dietary supplement, take 1 tablespoon 1 to 2 times daily. Can be taken undiluted, or mixed with water or juice. Consider taking this product in combination with NOW® OsteoBoron™ and Zinc. Contains no: salt, yeast, wheat, gluten, milk, egg, shellfish, or artificial colors or flavors. Vegetarian/Vegan Product.